How Long Can You Keep Leftovers in the Refrigerator? When you put leftovers in the refrigerator, you probably don’t consider how long they’ll remain edible — maybe you eat them in time or you discover that they’ve gone bad. That pattern may change after you read the following guide to the length of time that different foods can stay fresh in the ‘fridge — based on Food and Drug Administration recommendations. You might consider the durations listed above to be rough averages — if the temperature of your refrigerator is set colder then you might be able to keep things slightly longer, for instance. And speaking of which, you can freeze items for a lot longer. Readers, how much of your refrigerator space is taken up by leftovers? Food-Borne Illness Is Rising — What About Food Recalls? Is Inexpensive Food Making You Fat? Should You Eat Food after the Expiration Date? People used to think of shopping as the only thing to do the day after Thanksgiving. But now that Cyber Monday has become more popular than Black Friday as the start of the holiday shopping season — what can you do if you still have the day after Thanksgiving off from work? Although New York hosts its famous parade on Thanksgiving day, other cities hold parades the following day. Most of them are broadcast on TV so you don’t have to sit out in the cold (if that’s what the weather is like by you). If you really like parades, consider recording ones that take place in other cities — capture the footage on TiVo so you don’t have to sit through all the commercials. By now most ice skating rinks have opened for the winter season and have their holiday season decorations up. Skating gives you the flavor of the winter holidays without having to spend what you would if you went shopping. Similarly, most ski slopes have opened for the season by now, and if there isn’t naturally ocurring snow by now, the resorts can fabricate it. Although downhill skiing will cost you more money than other winter sports, cross-country skiing usually costs less. Either form of skiing gives you enough variety in the terrain to easily fill up a day if not longer. If you want to make more than a day out of traveling to a ski resort area, you might be able to find other winter sport-types of activities like snowmobile tours, downhill snowtubing (think: inflatable sleds) and even bobsled or toboggan runs. This can be as simple or elaborate as you can afford — and as your local resources provide. If there’s a toboggan or bobsled run near you that offers rentals, that’s usually more fun than free-form sledding. But you don’t need to go to any dedicated facility to sled. Heck, you don’t even need to own a sled if you have plastic trays you can borrow for the purpose. Thanksgiving weekend tends to see a lot of good films premiere, and attendance at movie theaters benefits. You don’t have to set foot outside to watch good movies this weekend — since the options for renting or watching on continue to proliferate. There’s also good-old cable television and the binge-watching craze, in which people watch entire seasons of series via online video streaming services. If you enjoy watching sports, you can probably find your favorite teams playing over the holiday weekend. Of course, it’s far cheaper to watch on cable TV than get tickets to see any of it in person. If you’re the betting type and happen to be within reach of casinos, you might find the camaraderie of a sports book rather fun. Books aren’t the only thing at the library; you can peruse magazines, borrow movies and audio recordings, and attend lectures or classes — the full range of activities depends on the specific location, but you can find out more by heading to your nearest library’s website. Although spring or even New Year’s Day are more common choices for doing a large-scale cleaning, there’s no reason why you have to wait until then. The proximity to the end of the year makes this Friday a good day to begin deciding what to give away or sell. Perhaps there are local sights of interest that you haven’t been to since you’re caught up in the day-to-day grind — well, now you have a chance to check out these destinations. Tour your home town or go on a day trip somewhere interesting, either on your own or even as part of a tour group. Find them on sites like ToursByLocals, Showaround and Vayable. You don’t have to (re-)enroll in college to take classes, let alone pay (much) tuition for them if you’re willing to participate in continuing education programs. A growing number of websites and apps offer courses on a stunning array of topics. Check out Coursera, Udacity and Lynda to see what you might be able to learn in as little as an hour or two. You might end up with a new hobby as a result. If you haven’t tried volunteering to help the needy, it can change your life. Going to a soup kitchen following the day of your Thanksgiving feast will make you appreciate what you have and get into the spirit of gratitude that is the original intention of the holiday. If you’re already involved with a nonprofit organization, look into whether the group has anything planned on Friday. If other members of your family are home for the day, playing cards or board games can provide a fun bonding experience and even laughter, depending on your game of choice; even multiplayer videogames can foaster that sense of community when your opponents are loved ones. Although museums and zoos with free admissions seem to be fewer and further between, there are some notable exceptions — including free days at establishments that otherwise charge money at the door. If you have kids, this is a great way to entertain them when they have the day off from school. However, bear in mind that a lot of other families come up with the same idea, so museums and zoos tend to get really crowded on days like Black Friday. Even if you didn’t host Thanksgiving dinner yourself, whoever hosted the meal might have given you leftovers to take home. Heat them up or make turkey sandwiches and enjoy. If weather conditions permit, you might want to go on a hike — or at least a walk — on Friday. If it’s too cold for a proper stroll, you could try to make it brief. If you’ve been at your current job for at least a year and are beginning to feel stir crazy, there’s nothing like a day off to update your resume and online career profiles — on LinkedIn and other jobs websites — to be ready for recruiters. Black Friday is great timing to do such an update because a lot of companies step up their hiring in January. A day off from work gives you a chance to put in a lot of quality time reading a good book — or even catching up on the periodicals you enjoy. No need to buy that book or other reading material if you have a library card or a membership in any of the growing number of “all-you-can-read” services, including Amazon’s Kindle Unlimited for books and Prime Reading for magazines. A day off gives you the chance to organize any collections you might already have or get started on one. If you don’t collect anything yet, it’s never too late to start a collection — and it doesn’t even have to cost you money. It could be as simple as collecting images to post on Pinterest, pasting things in an offline scrapbook, or amassing physical memorabilia or antiques you find on Etsy or eBay. Let what you’re already interested in serve as the gravitational pull toward starting a collection. Although working out usually only takes an hour or two, if you have a gym membership you might find a social outlet there. On a day off like Black Friday, the people you normally make small talk with probably have more time on their hands for activities following their workouts; seize the opportunity to get to know people better by suggesting an outing after you’re all done with exercise. The day after Thanksgiving is a popular time to go see live matinee performances of holiday classics, like the Nutcracker Suite, A Christmas Carol, and even It’s a Wonderful Life. Larger cities have as many as 10 different holiday-themed plays, musicals and ballets playing that day — if your first choice is sold out, hopefully one of the others isn’t. Remember to check for discounted tickets on GoldStar. Although physical stores and malls are crowded on Black Friday, a potentially more relaxed way to take it all in is simply to people watch. This is ideal if you can situate yourself in a cafe that has a good view of all people coming and going from stores. Another great vantage point for watching others might be in the vicinity of one of the larger holiday trees that are erected by neighborhood organizations or even city government (most of them did this earlier in the month). Some neighborhoods have a habit of going all out with holiday lights and the homeowners in these areas may have put up their holiday decorations already, much like what retailers and civic entities do. Go for a night-time drive through one of these neighborhoods and you beat the — well, perhaps crowds might not be an accurate way to describe the phenomenon, but nonetheless you would be engaging in this activity before many others think of it. Whether you habitually send out holiday cards or not, the official start of the holiday shopping season is a good time to get started — before the last minute rush of gifts and cards slows down the postal mail. And with Christmas still a good month away, you have enough time to go longer-form on some of those missives. If you want to save money on paper, you could always send e-cards, although they aren’t necessarily free anymore; many now require paid subscriptions. Social media, and Facebook in particular, makes it easier than ever to reconnect with people from the past — you can see who else is online when you are and chat in real time. From there you might even schedule a time to engage with them in any of the other activities mentioned in this article. Apparently, Black Friday has come full circle as a day for shopping, at least among online retailers. They started promoting Cyber Monday a bit over a decade ago after noticing an organic trend of increased online spending on the day after Thanksgiving. The result of these promotions ultimately made Cyber Monday so popular that it overwhelmed the technology and logistical operations that have made e-commerce successful. To prevent that from recurring, retailers have recalibrated their marketing messages to encourage people to begin holiday shopping over a broader period of time. Amazon, for instance, declared this to be “Black Friday deals week” in a promotional email that went out this morning — and the online retailer was one of the leaders in marketing the Cyber Monday concept. Best Buy, on the other hand, has been plugging holiday shopping deals since the beginning of the month. Wherever you prefer to shop, you don’t have to wait until Monday to find good deals online. And if the mood to shop strikes you on Black Friday, go for it. You’ll find abundant choices to keep you busy comparing prices. Readers, do you intend to shop online this Friday or do something else? What do you have planned for the holiday weekend? Have you picked up a rotisserie chicken from but haven’t been too sure about what to do with the leftovers? Rotisserie chicken is on the menu at my house about once a week and, with only two people in the house, there are usually leftovers. Instead of simply re-heating the chicken, there are many other ways to use rotisserie chicken. Below are a few of my favorite rotisserie chicken leftover meals. One of the easiest ways to use rotisserie chicken leftovers is to make chicken salad. This can be a grilled chicken salad (lettuce, tomato, dressing, croutons, etc.) or it can be a chicken salad sandwich (my preferred leftover meal). All you’ll need is mayonnaise, salt, pepper, grapes (or Craisins) and your leftover chicken. Chop the leftover chicken that you have into small (almost shredded) pieces. Then take a few grapes and cut them in half (or take Craisins out of the bag if you prefer Craisins). Once you have done that put the chicken in a bowl and add salt and pepper to taste. Then mix in the desired amount of mayo and the grapes (or Craisins). Serve your chicken salad on a lettuce wrap, bread, bagel, wrap or any other sandwich-like food item. Making chicken pot pie from leftover rotisserie chicken is another favorite (especially during the wintertime). 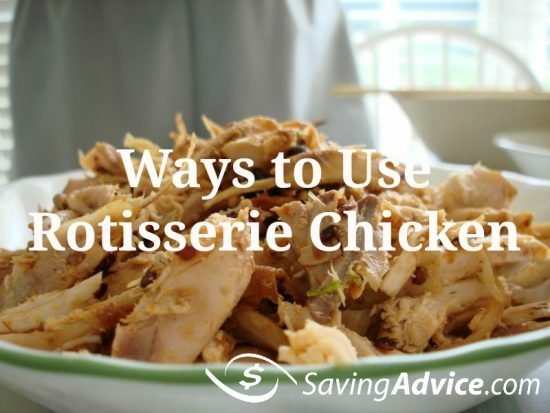 All you have to do is chop the leftover rotisserie chicken up and set it aside in a bowl. Add canned gravy, salt and pepper (to taste) and any vegetables you would like (I use corn, carrots and peas) in the pot pie to the bowl. Stir until all of the ingredients are eventually distributed through the mixture. Preheat your oven to 425 degrees and then spray a pie pan with nonstick cooking spray. Then place a store-bought, pre-made pie crust in the dish. Spoon the chicken mixture into the pie crust and level it out. Place another pie crust on the top. Slice it to vent and put it in the oven for 30 to 40 minutes (or until crust is golden brown). Another wintertime favorite for ways to use rotisserie chicken is chicken and dumplings. To make this easy dish you take your leftover chicken and boil it off the bone. Remove the chicken from the broth you’ve made and bring it to a boil. Then use a thick pancake mixture to make dumplings. *To make better tasting broth, add gravy to the water. This is actually one I recently learned from my boyfriend. His father used to make it for him and it is a great way to use those chicken leftovers. Preheat the oven to 400 and begin making StoveTop stuffing according to the directions on the box. Chop the leftover chicken up and line the bottom of a nonstick baking pan with it. Then pour canned gravy over the chicken and top it with the stuffing. Bake the casserole for about 30 minutes or until the stuffing is golden. Chicken and gravy is possibly the easiest of all the ways to use rotisserie chicken. All you need is a can of gravy, your leftover chicken and whatever you would like to serve the chicken and gravy over (I usually use mashed potatoes, rice or biscuits). Chop your leftover chicken up, add it to the gravy and heat. Serve it over your favorite side dish or as a chicken bowl (mashed potatoes, corn, cheese, chicken and gravy). These are just a few ways to use rotisserie chicken that aren’t the regular run-of-the-mill re-heat and eat. There are plenty of other creative ways to use your leftovers! Do you have any awesome leftover recipes? Share them with us. Everyone would like to save money on food if it means they can still get the same quality for a better price. One are where most people can save on their food bill is to reduce the amount of food they waste. Americans through out as much as 40% of their food according to a recent study. Almost all of us have experienced some form of food waste in our homes. Sometimes it’s food that goes bad before we get around to eating it, and sometimes it’s leftovers that spoil because we don’t actually want to eat it. However, everyone can take measures to prevent or reduce food waste. One of the easiest methods is to organize your refrigerator. Having it packed with food and leftovers means that you’re less likely to know what’s in there. How often had you had perfectly good food spoil because you didn’t see it inside the fridge? Throw out old food, and when you buy new groceries, store them toward the back of the fridge, keeping the food that’s more likely to spoil up front. While buying bulk can be a great way to save money, it’s important that you never buy in bulk unless you either know you’re going to use the food or if it’s something that won’t spoil such as pasta or rice. Have you ever bought a gigantic tub of yogurt because it was a bulk sale, only to have it expire before you eat it? When buying bulk, make sure that you only buy items you’ll use. It’s important to make a list of what you already own and what you need to buy. You don’t want to go buy a bunch of food items you already have, do you? Making a list of what you have will remind you not only of items you don’t need to buy, but items that you need to use before they expire. For example, there’s no point in buying a jar of mayonnaise if you already have a half-finished jar in the fridge. How many times have you thrown out overripe fruits or vegetables? It’s such a waste of money, especially when you can use those items, but usually not how you had first planned. You can make smoothies, pies, or other desserts with fruit that’s a little too ripe. With vegetables, you can make stew or sauces. While you won’t be able to reuse every type of overripe fruit or vegetable, trying to reuse them in a different dish is much better than letting them go into the trash. A lot of people are used to receiving large portions since restaurant portions keep getting larger and larger. But large portions mean that some people might not finish the entire meal and end up throwing away the leftovers. When you’re at home serve smaller portions and go back for seconds if you’re still hungry. This way you’ll waste less food and save more for additional meals, and it is also a great way to keep the weight off. Did you make a casserole that’s too big for you to eat? Maybe you have way too much cookie dough. Or maybe you bought too much fruit and don’t want it to go bad. Well, your best option is to freeze these items! Most foods can be frozen and stored until you’re ready to use it at a later date. Sometimes the best way to reduce waste is to freeze food. So if you’re tired of eating that same dish day after day, freeze some for one of those days when you have no other food options. A lot of us are guilty of immediately throwing out food when we see it’s nearing its “use by” or “sell by” date. However, the “sell by date” is the last date a retailer is recommended to sell the product while the “use by” date is the end of the high quality of the item. Most, but not all, foods are okay to consume up to a week after these dates. So if you have a jar of pasta sauce that’s passed it’s “use by” date by a day, make sure you use that immediately instead of discarding it. How many times have you gone out to eat only to receive your meal and realize that you’re never going to eat it all? Sometimes, you’re out somewhere where it’s inappropriate to take leftovers home, so you end up leaving more than half the meal on your plate. If you’re out with someone, share your meal – as long as you’re comfortable with them, that is. Do you have a lot of food stored in your freezer or refrigerator? Do you have a couple of random ingredients in your fridge or cupboards and nothing else? Well, you have all that food for a reason. You bought it, so why not eat it? If you go to the store, you’re going to end up buying new food and letting what’s already in your fridge or cupboards go bad. This should be one of the most obvious facts for anyone who routinely grocery shops. When you’re hungry, you’re more likely to buy food because it looks good, not because you actually need it. Unfortunately, fresh produce is usually the first thing you see when you enter a supermarket, so it’s the first thing you grab. Eat before shopping to cut down on food that would otherwise go to waste. Think You Hate Leftovers? Think Again. A friend of mine was laid off from her job three months ago. Not surprising, given the current economy. Anyway, like many people, she’s in over her head financially. Without her salary her family is having trouble making ends meet. Since it looks like she might be out of work for awhile, she came to me for help on stretching their budget. After I explained the method to her, she was really excited. She could see that the time and money savings were going to be substantial and helpful for her. After the first month, I asked her how it went. “Well, it didn’t go so well,” she admitted. “What went wrong?” I asked. “No one liked the food. They felt like they were eating leftovers all month. All I heard was complaints about how everything tasted bad reheated and they wanted ‘fresh’ food. I ended up throwing most of it out because no one would eat it and we went to restaurants instead. We wasted all that money,” she said sadly. I was puzzled by this. The recipes she used were ones that freeze very well. Once they were reheated they shouldn’t have tasted any different from “fresh” food. I’d coached her on the best storage methods and I knew she hadn’t left anything in the freezer long enough to get freezer burn, so I wasn’t sure what the problem was. “Maybe you could come over and talk to them,” she asked. On the appointed day, I showed up at her house for “the lecture.” I showed them how much money they were saving and how much time mom was saving by cooking this way. I explained to them that the food was okay if it was frozen. No one was in danger of getting food poisoning. I told them that if they partnered with friends in the once a month cooking game they could get a lot of variety. I explained that, once heated, the food tasted exactly the same as if it had been made that day. I told them that things like garnishes, condiments, etc. were added “fresh” after the reheating to keep those items from soaking into the food and tainting the taste. I used every argument in the book. None of it made a difference. Okay, fine. I know when I’m beaten. I could see, though, that my friend really wanted this to work. She could see the potential. So I thought some more. Then inspiration hit. The next month when it came time for my friend to shop for her once a month cooking session I invited her whole family along. We loaded up the husband and kids in the car and headed for the store. As we walked the aisles, I told them to pick the things that they liked and would eat. Dad and the kids made a beeline for the frozen food section. They picked out pizzas, burritos, stuffed chicken, Bubba Burgers, Uncrustable sandwiches, Hot Pockets, stuffed potatoes, frozen bagged meals, and frozen dinners like Lean Cuisine and Hungry Man. I’m sure they thought I was insane when I burst out laughing. “What’s so funny?” the father asked. “You won’t eat the things your wife makes and freezes but you’ll eat things that someone else makes and freezes?” I was laughing so hard I could hardly breathe by that point. “It’s not the same,” the fifteen year old challenged. “Isn’t it?” I asked. “Your mom made enchiladas last month and froze them. How is that any different from that frozen burrito you’re holding in your hand that someone else made and froze? It’s the same with that Lean Cuisine chicken parmigiana. Your wife made chicken parmigiana last month and froze it but you wouldn’t eat it. But you’ll eat that chicken parmigiana that someone else made and froze in a cardboard box? If she bought all of this stuff right now you’d eat it?” I asked. “Well, yeah,” said the father. “I’ve got news for you,” I said. “The only difference between this frozen stuff and the stuff your wife made are the ingredients and the cost. She made things with healthier ingredients than you’ll find in any of this stuff. Fewer preservatives, less fat and calories, and less sodium. And the price for her to make this stuff is incredibly cheap versus the price to buy it pre-made. That pizza you’re holding that’s six dollars? She made the exact same thing for under two dollars. Silence on aisle three as they pondered this. I could see them looking for an objection, any objection to my words. My friend clutched my arm as she could sense victory looming. I waited. Finally the husband spoke. “I guess I see your point. It does seem silly when you put it like this,” he said. He looked at his kids. “We’ll try again, won’t we?” he asked them. “Yeah, sure,” said the oldest, unenthusiastic, but at least willing. We went back to the front of the store and began shopping again, this time for ingredients instead of pre-made meals. The next month was far more successful. The family put aside their objections to “reheated” food and reminded themselves that it was really the same as the frozen food in the grocery store. My friend and I have paired up and we each make several meals and trade so that there is more variety for them to choose from. I hear all the time how much people hate leftovers and how much they hate food that has been prepared ahead of time and frozen. I hear every objection. How reheated food tastes gross. How freezing ruins the taste of the food. How fresh is so much better. And on and on. But many of these same people are more than happy to eat frozen food from the grocery store. The moral of this story is this: What you think of as “leftovers,” is often nothing more than “frozen food.” They are the same thing: Food that someone has prepared, cooked, and then frozen so that it may be preserved for consumption at a later date. Only the “leftovers” you won’t eat are much healthier and prepared for a fraction of the cost as the stuff in the store. The next time you’re tempted to turn up your nose at leftovers, think about it. This weekend I was reading “You’re Broke Because You Want to Be: How to Stop Getting By and Start Getting Ahead” by Larry Winget. (A pretty good read, by the way. The advice is nothing groundbreaking, but his straight talk and no excuses approach is entertaining.) Anyway, in the book he states that most people who are financially secure don’t eat out often, if ever. I agree. Eating out is expensive and easy to lose track of. The meals add up before you realize exactly how much you’ve spent. It’s much cheaper to cook at home. We all know this already. Thinking about it further, I came up with a corollary to that statement that perhaps Mr. Winget should include in his next edition. People who are financially secure eat leftovers. I realize that I’m potentially opening a can of worms here. I’ve met quite a few people in my life who adamantly defend the reasons why they won’t eat leftovers. The kids won’t eat it. It doesn’t reheat well. It’s a pain to store excess food. And on it goes. As a leftover lover, I don’t buy any of it. Since when do the kids get to dictate what’s served at dinner? If they don’t like it, send them to be without dinner. There are few things that won’t reheat well, if you pay attention to the needs of the food and don’t just blindly toss it in the microwave on high for five minutes and hope for the best. No matter the reason people give for refusing to eat leftovers, the end result is the same. Waste. It wastes money and resources to simply throw away food. I don’t see how anyone who is comfortable with such waste can be comfortable financially, at least not long term. It would seem to me that those who blithely toss excess food are probably not that careful with their money, either. Tossing perfectly good food in the trash is much the same as tossing money in the trash. You paid for that food. In order to get your money out of it, you need to eat it. If you pay $10 for an entree at a restaurant, eat half and then leave the rest behind, you’ve tossed five dollars into the trash can. Is that smart? Nope. Will this lead to long term financial security? No way. So with that said, what are some of the reasons to eat leftovers and how can you make them more appetizing if you or your kids really have a problem with them? This is one of the biggest reasons to eat leftovers. If you bring your leftovers home from a restaurant or you eat food that’s leftover from something you cooked at home, you’re getting the full value out of what you paid. It’s also one less meal that you have to pay for, thus reducing your overall food bills. As the designated chef in our house, let me tell you that people in my house would go hungry if not for leftovers. I don’t want to cook every night. I have other things I want to do. I seize every chance I get to serve leftovers. In fact, I intentionally make many dishes that I know will be served more than once. It allows me to maximize my time. If you regularly brown bag your lunch, you probably get tired of sandwiches. Why not bring your leftovers from the steakhouse for lunch? Watch your coworkers drool as they eat their bologna sandwiches. Food that gets tossed goes to the landfill. It wastes not only the food, but the resources that went into making it. A cow had to die for your steak. Is it fair to the cow for you to throw half of it in the trash? Is it fair to the farmer that spent his time and labor on those vegetables that you throw them in the trash? Not to mention the energy that goes into processing and preparing the food, and the packaging that is used. It’s not just throwing food into the trash. You’re wasting all of the labor, energy, and materials that went into that food, as well. 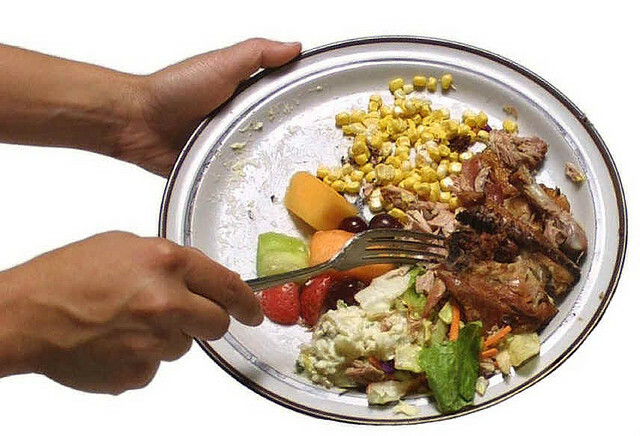 The USDA estimates that Americans waste 96 billion pounds of food each year. Another study estimates that we throw away one grocery bag’s worth of food out of every three that we buy. One in three bags you bring home from the store is likely wasted. Stop and think about that for a second. Blows the mind, doesn’t it? If eating leftovers is “beneath” you and you’re willing to waste that money, you probably have deeper financial problems. You aren’t willing to do the work and make the sacrifices necessary to bring wealth into your life. You may not be willing to take a job that may not be your dream job, but allows you to pay the bills. You may not be willing to pick up change off the street, or shop for the best bargain you can find. In times of financial troubles, you may be the one who won’t cut the cable TV. There’s an attitude of, “I shouldn’t have to do that because I’m better educated, smarter, wealthier, etc.” I’m not saying that eating leftovers will net you millions, but it can be an indicator of your overall financial outlook and your willingness to do what is required to get ahead in life. Restaurant portions are huge. It’s far better for your waistline to divide the dish in half and eat it over two meals instead of cramming it all in at once. Eating leftovers of something you made at home is also preferable to eating too much at one meal. You might find yourself losing weight by eating leftovers. So you just had spaghetti yesterday and don’t want it again today. Who said you had to eat it today? Most foods will keep for a few days if refrigerated correctly (and some can be frozen for longer periods). Spread your leftovers out so that you don’t have to eat the same thing the next day. Or use the leftovers as a starting point for a whole new meal. Use leftover meat and vegetables as ingredients in stew, for example, or pool all your leftovers for the week and have a buffet on Friday night. 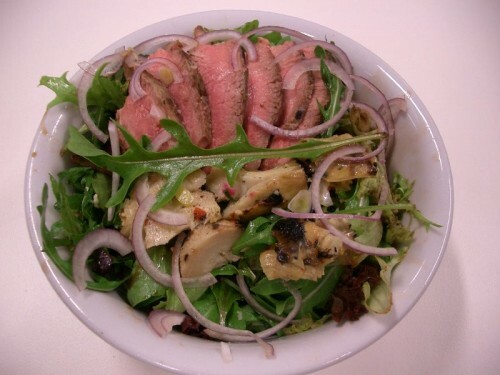 Don’t want to take your leftovers to work because it’s messy or a hassle? Invest in reusable plastic containers of varying sizes to make it easy to store, heat and transport food without mess or hassle. If something makes a good snack for the kids, like mac and cheese, consider putting some of it into small, snack sized containers to encourage kids to eat it. If they can just heat and eat without having to hunt for plates ands serving utensils, they might be more receptive to leftovers. Some foods shouldn’t be nuked on the second go round because they get soggy. Cook these in the oven or toaster oven. Some should be put in the skillet. Some foods are best eaten cold the second time around. Experiment until you know how to get food to come out as good the second time as it was the first. It is possible. Some foods do require a little extra spicing up the second time around. Keep a stock of basic spices or sauces on hand and experiment until you learn which foods require which spices to liven them up a bit. I hear you now. What do leftovers and gas have to do with each other? Every meal of leftovers that you eat postpones that trip to the restaurant of grocery store a bit longer, saving you the gas required to get there. With gas going nowhere but up, eating at home as much as possible saves money in more places than just the food budget. This makes it easy to see what you’ve got and when it should be eaten to avoid spoilage. No more guess work or, “But I didn’t know we had that” moments. If you know there are some things that you absolutely will not eat as a leftover, don’t buy or make it unless you are prepared to eat the whole thing in one go. Only cook and buy meals that you know someone in your house is willing to eat again. Otherwise, you’re wasting money and food. Hopefully you’re now converted to the idea of eating leftovers. However, if you absolutely cannot reconcile yourself to the idea of leftovers, then buy and order less. Share meals in restaurants or order smaller items like appetizers. Buy and prepare just enough for your family to eat it once. Smarter shopping and ordering still saves money and eliminates waste, but doesn’t make you eat leftovers.